GORKHA, July 12: Gorkha was the epicenter of the devastating earthquake of April 25, 2015. While the destruction was massive in 14 districts, Gorkha, naturally, suffered the hardest. Physical loss was shocking, but even deeper were its effect on the victims. Those who survived the disaster felt relieved when the government distributed assurances of resettlements to them. When the tragedy hit, monsoon was on their doorstep. The government, as promised, could not relocate them to better places and the rain drenched their families through the monsoon. These miseries were widely reported by national and international media. But government kept assuring that respite was on the way. Winter approached and that felt equally hard upon the quake victims. They lamented of the extreme cold taking toll on their health. 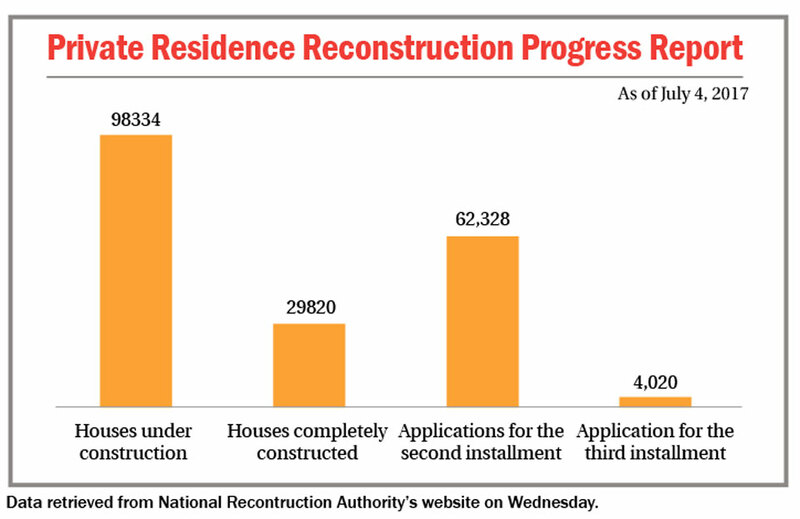 But the government again told that they would get better house to live in as soon as the National Reconstruction Authority comes into operation. There was no option for the hundreds of thousands of families in Gorkha and elsewhere other than to wait. A year passed by and when the second monsoon came knocking, the quake victims were still in temporary shelters. With no tangible support from the government, and with the NRA struggling to get its leader because of the political mess, they had no option but to suffer yet another monsoon. Their temporary huts were not able to keep them dry inside. Even shelters who were covered with corrugated sheets could not keep their inhabitants dry because of their poor quality. Their stories once again were on all media and once again government was pressed for delivering aid to them at the earliest. The government took some steps. They started getting installment for house construction. However, the process was so lethargic that real change was hard to come by and this had stretched the victims into their third consecutive monsoon in temporary huts. Three years of endless wait has left these victims now speechless. They have little zeal left now to criticize the government. “It is raining every day and the water leaks in. We had a miserable monsoon for the last two years and this time also we don't expect anything better,” says Santa Bahadur Gurung of Sulikot Rural Municipality. “The fifty thousand rupees grant that the government provided to my family is still in the bank. The amount is not adequate to start constructing our house,” he said responding to questions as to why his family has not started building their new house. He opined that it would have been better for people like him if the government provided all the installments in a go. The government had provided Rs 50,000 as the first installment of house grant to earthquake victims. Thought the government took months to distribute this installment, many later complained of not getting it. There were also reports that the grant was distributed to people who did not qualify for it. According to the NRA, construction of 29,820 houses in several districts has been completed while construction of 98,334 houses is underway. Similarly, 62,328 victims have applied for the second installment of house grant and 4,020 victims have applied for the third installment of the grant. While none has received the third installment, there are many yet to receive the second installment. Post earthquake, landslides had made the quake victims' life further miserable. Gorkha earthquake victims lament that they lost not only houses but also their land due to the landslides. Presently also some of these victims are still living in unsafe shelters in lack of proper land to relocate. Only few have been able to built new concrete house for themselves. 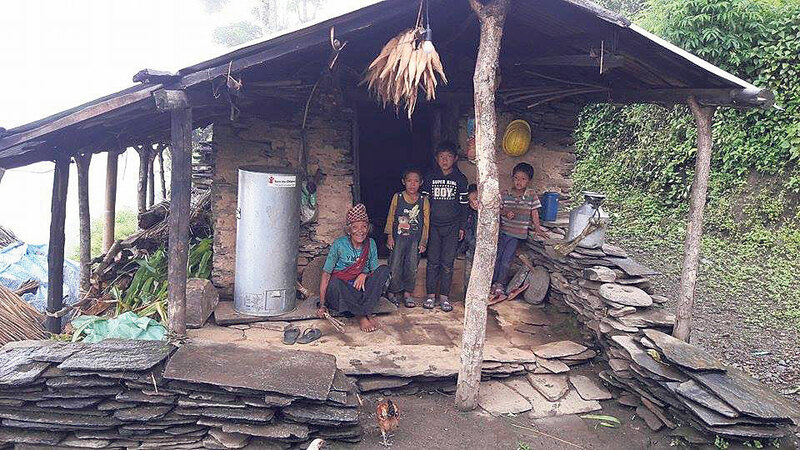 Gurung said that constructing a house in Gorkha is very costly due to poor transportation facilities that he claimed directly inflated construction material's prices. 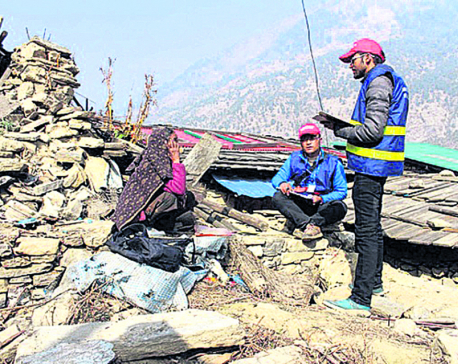 Local Development Officer of Gorkha, Narayan Acharya said that the quake victims are not showing zeal to build house. “What they have received or are likely to receive has left them hopeless. Given the grant amount and the steep cost of construction materials, they feel that building a house is not their cup of tea,” he said.